flight controls to be transmitted to the rotary-wing blades. The sleeve and spindle and blade dampers allow limited movement of the blades in relation to the hub. These movements are known as lead, lag, and flap. ! Lead occurs during slowing of the drive mechanism when the blades have a tendency to remain in motion. ! Lag is the opposite of lead and occurs during acceleration when the blade has been at rest and tends to remain at rest. ! Flap is the tendency of the blade to rise with high-lift demands as it tries to screw itself upward into the air. 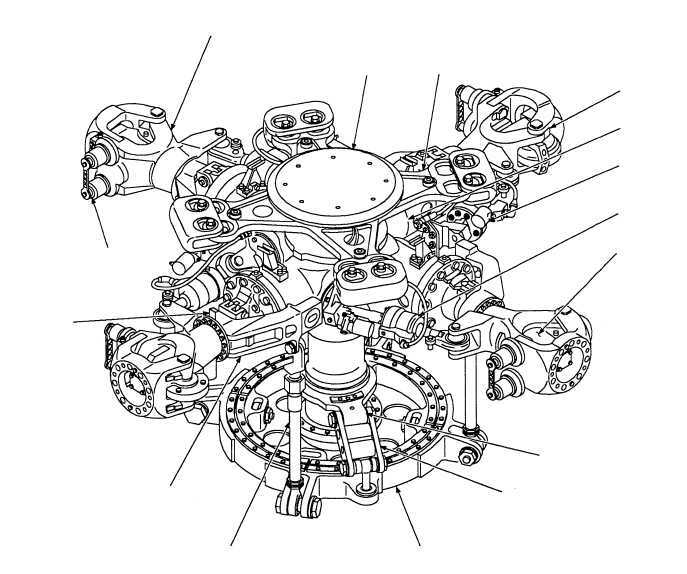 Antiflapping stops and droop stops restrict flapping and conning motion of the rotary-wing head and blades at low rotor rpm when slowing or stopping. TAIL ROTOR GROUP The directional control and antitorque action of the helicopter is provided by the tail rotor group. See 4-17 BLADE FOLD ACTUATOR FAIRING BIFILAR DAMPER PITCH LOCK ACTUATOR ROTOR HUB FOLD HINGE SPINDLE ASSEMBLY BLADE LOCKPIN PULLERS ROTATING SCISSORS LOWER PRESSURE PLATE SWASHPLATE PITCH CONTROL ROD PITCH CHANGE HORN ANf0119 ROTOR HEAD BALANCE WEIGHTS Figure 4-19.Main rotor head/hub assembly.